I am running rkhunter as a cron job and thus receiving notification any time I’ve installed something. Ideally I should be checking the output immediately and updating its database if it is just reporting a change due to a software update I’ve performed. But very often I don’t have time to do it right away and end up forgetting for days. At some point in time, I do check the logs and see that some pieces of software have been changed. By that time I usually do not remember what packages I’ve updated since last rkhunter database update. So I needed a way to check the history of installation of packages. The bad news is that there is no apt-history command which would easily display the history of installed, updated and removed packages. The good news is that there are some log files which contain the whole history and can be used as a basis to extract this information. Before we start, I wanted to mention that I do know that aptitude also writes a log file (/var/log/aptitude) but when I looked at it, it only contained information about what happened in the past 8 days. So it wasn’t really useful for my purpose. There is probably a way to configure aptitude to store more history in there but since I found another good solution, let’s stick to this… Also if you use Synaptic, there is also a “View History” function in the GUI. But it only shows changes made with Synaptic, not from the command line or automatically e.g. by Plesk auto-installer. Processing it with Unix tools is possible but it is a pain because you have to consider groups of lines, between a Start-Date and an End-Date, and the number of lines inbetween is not always the same (potentially one line for installs, one line for upgrades and one line for removals). This can of course be procesed with some grep, awk, sed and other utilities. But this has two problems: first I’m lazy, second if the command is too complex I will never remember it even if I use it daily. zcat -f $(ls -tr /var/log/dpkg.log*) | grep " install "
zcat -f $(ls -tr /var/log/dpkg.log*) | grep " upgrade "
zcat -f $(ls -tr /var/log/dpkg.log*) | grep " remove "
# zcat -f $(ls -tr /var/log/dpkg.log*) | grep " remove "
Note that keine means “none” in German, so removing a package is going from a certain version to none. Note that for all commands below, you might need to add a leading sudo depending on your system. This means that there are packages which can be updated but they were not. So what are the reasons why some packages wouldn’t be updated ? apt-get upgrade installs the newest versions of all packages which are already installed on the system from the configured sources. What apt-get upgrade doesn’t do is install additional packages or remove existing ones. The fact that it doesn’t install new packages is the reason why your packages are being kept back. These packages have an updated list of dependencies and apt-get would need to install new packages in order to install the new version of the software. So what can you do about it ? There are basically 3 ways to handle it. The first one is to use dist-upgrade. apt-get dist-upgrade does basically the same as upgrade. But additionally, it removes and installs packages in order to accommodate the updated list of dependencies of newer versions of the install packages. When using diet-upgrade, you will be presented with a list of changes which will be applied. There will be a list of packages being additionally installed and a list of packages which will be removed. You have to especially pay attention to the list of packages to be removed. In the list of packages to be removed, you will not only find packages being removed because they are not needed anymore but also packages which will be removed because they are not compatible with the latest version of the packages you are updating. On my system, this is very often the case for Plesk which tends to force me to keep outdated packages for a little longer. Forcing an update of these packages would result in Plesk being uninstalled. Recovering from this is not very easy… Also, if you install beta versions of some software, you might also end up getting long list of packages to be removed because they would not be compatible anymore. Also, you might in some cases have packages required by others but not cleanly listed as a dependency (once had this problem with subversion). This will first resolve the kept-back dependencies and will offer to install additionally required packages. Start aptitude, select the list of upgradable packages, press “g” twice to install. Then answer the questions and follow the instructions. If all of this doesn’t work, you may want to give some of the following a try. These are various things I’ve needed in some cases to get rid of conflicts using apt-get. I switched to a MacBook Pro 3,5 years ago. Until then, I’ve mostly had Windows machines at home even though I’ve always been more of a Unix/Linux guy. We still had a netbook which was delivered with Windows 7 Starter. I quickly upgraded to Windows Home Basic. Not sure why this Starter Edition even exists. It’s just an operating system with so many restrictions that any OS available 10 years ago would actually be better. Well, the netbook has an Atom N455 processor and 2 GB of RAM. As always with Windows, the longer the machine was in use, the slower it was getting and with this low spec machine, it was even worse. So yesterday, we got fed up with waiting all the time while planning our next vacation and decided to install Linux. I first had a look at which distribution would make sense. I of course needed a low footprint distribution so that it can still run smoothly on this netbook which is already a few years old. Also I didn’t want to spend weeks trying to get all drivers working. Also I needed to be able to install it without an optical drive which I do not have in the netbook (and I didn’t want to spend hours looking for the external DVD drive I have somewhere in a box in the cellar). I finally decided to install Easy Peasy. 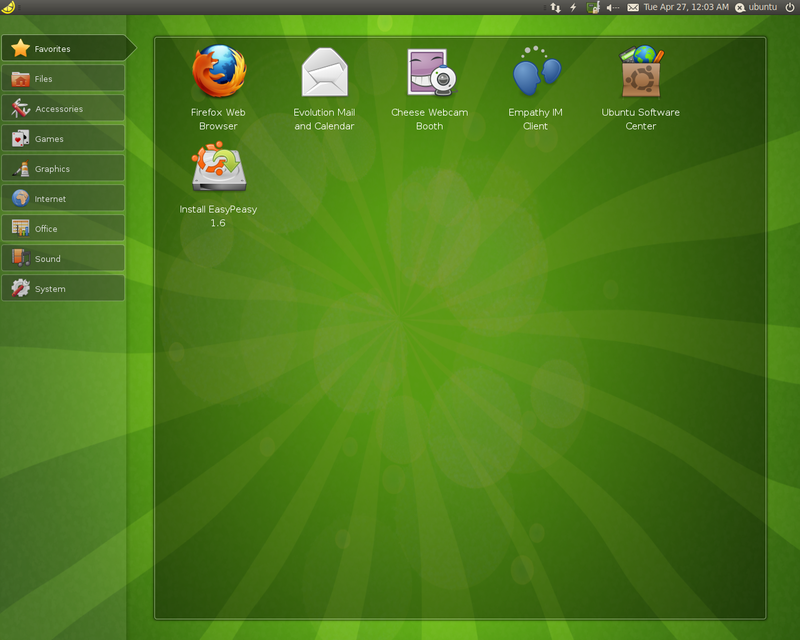 Easy Peasy is based on Ubuntu (so you can use the Ubuntu package administration) and was specially build for netbooks. It has a low footprint, the ISO is less 900 MB and it brings most drivers you need on a netbook. The UI is also optimize for smaller displays. It uses the Netbook-Launcher from the Ubuntu Netbook Remix and application windows are maximized and displayed without a title bar. Easy Peasy also brings quite a few open source applications like OpenOffice, Songbird and Firefox. The nice update management makes sure that you always have the latest version of the different software. You can write the ISO on a memory stick using UNetbootin. Like this you can also first test it and see whether it works for you before overwriting your previous OS. I had a small problem. My Wireless adapter needed a Broadcom driver which wasn’t part of the default package and needed to be downloaded. Of course without driver, no Wireless connection and thus no Internet to download the driver from. So I first had to find a network cable and connect the netbook directly to the router. Installing the driver was no issue at all and I only needed the network cable for a few minutes. Easy Peasy is a further development of Ubuntu Eee but is now not only limited to Asus Eee PCs (although I actually do have one) but is meant to be used on any netbook. I still need to test it a little bit more but I’m already very happy with the UI, the performance and the ease of installation and update. If you need to quickly find the fastest Archive mirror to download Debian packages, you can either use apt-spy as shown here or use a tool called netselect-apt. Need to get 37.9 kB of archives. After this operation, 171 kB of additional disk space will be used. Selecting previously deselected package netselect. Selecting previously deselected package netselect-apt. Choosing a main Debian mirror using netselect. Duplicate address 212.36.0.70 (http://ftp.bg.debian.org/debian/, http://debian.spnet.net/debian/); keeping only under first name. Duplicate address 128.61.240.89 (http://128.61.240.89/debian/, http://debian.gtisc.gatech.edu/debian/); keeping only under first name. Running netselect to choose 1 out of 379 addresses. # to work with most packages. netselect-apt is faster than apt-spy but supports less option and it is e.g. not so easy to select a region or country. netselect-apt is also faster because it doesn’t actually benchmark the mirrors but just pings them. So the speed measurements made by netselect-apt are not as accurate as the one done by apt-spy. Another difference is that netselect-apt automatically gets the latest list of archive mirror. With apt-spy you’d need to first run it with the update option. apt-spy is a tool which tests the bandwidth of Debian archive mirrors and generates a file in /etc/apt/sources.list.d with the source list for the fastest mirror. -d to define which distribution to use. You can use stable, testing or unstable. You can alternatively also use a distribution name e.g. squeeze. You need to set a value to this parameter. -a to define the area to check. If not set, apt-spy will check all known mirrors world-wide. Use one of these values: Africa, Asia, Europe, North-America, Oceania or South-America. Need to get 33.4 kB of archives. Selecting previously deselected package apt-spy. Without using the -a parameter, checking the bandwidth of all mirrors will take some time. Next time you run apt-get update you’ll see that the new mirror is used. Address space layout randomization (ASLR) is a method to make hacker’s life more difficult by randomizing the position of the heap, stack, executable and libraries in the address space of the process. ASLR is enabled by default in Linux since kernel version 2.6.12.
sudo bash -c "echo 0 > /proc/sys/kernel/randomize_va_space"